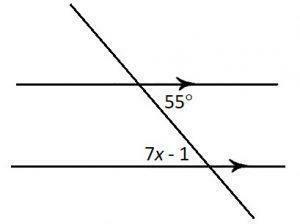 Non-intersecting straight lines, which do not meet when produced however far on either side, are called ‘parallel’. 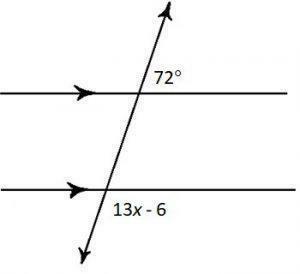 The distance between the parallel lines AB and CD is the length of the perpendicular PQ from P (any point in AB) to CD. The distance between any two parallel lines will always remain the same. A line is parallel to itself. Through a given point, only one straight line can be drawn parallel to another straight line. A ‘transversal’ is a straight line which cuts two or more straight lines. 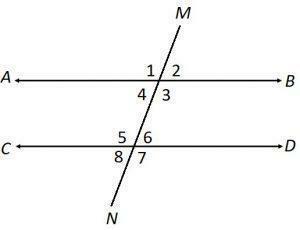 The pair of angles 1 and 5, 2 and 6, 3 and 7, 4 and 8 are called ‘corresponding angles’. 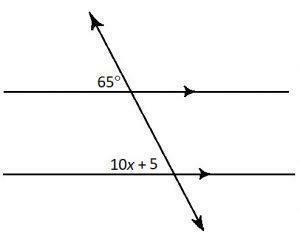 The pair of angles 3 and 5, 4 and 6 are called ‘alternate angles’. 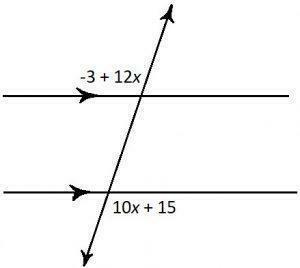 Example: Find the value of x. 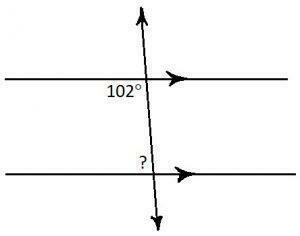 What is the measure of the indicated angle?